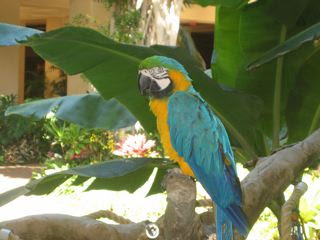 This Blue Macaw named Duke echoed my Aloha with his own Aloha right back at me. When I bobbed my head up and down, Duke did the same. The little crowd of humans around Duke’s perch squealed its approval. It is satisfying to hear a member of the Animal Kingdom repeat to us what we want to hear. Humans are members of the Animal Kingdom, so it follows that many of us parents and teachers are most pleased when our children and students echo our points of view, go with the flow, and reinforce our beliefs by agreeing with us. Many of my students over the years were first class sycophants. They needed that “A” for Stanford, Harvard, Yale, or Berkeley. It’s funny. The students I remember are the ones who thought for themselves, the ones who questioned the relevancy of an assignment or the grade on an essay, the ones who would later go on the deliver the type of thinking and acting that enacts positive change. Try to teach Billy Collins’ poetry to students whose primary focus is the right answer. Try to teach Zora Neale Hurston to students who don’t want to wrestle with all the thematic possibilities of her writing. Try to teach critical thinking about current events, politics, philosophy to students whose academic mantra is 1+1=2. Solving today’s problems, with all their global and theoretical complexities, takes critical thinking, the ability to examine scientific, economic, mathematical, and social problems in creative ways. What can we do as parents and teachers to foster such thinking? Parents can expose their children/young adults to activities that demand critical thinking. Start by throwing away all hand held computer gaming toys. Continue by exposing your children/young adults to activities that pull the miracle of the natural world into their world. Finish by turning off the TV and computer for most of the week. These activities thwart creativity by filling time. Filling time. Filling time. Teachers can reward students for thinking instead of regurgitating, participating instead of marinating, and risking instead of hibernating. Duke is a parrot. Our children and students should not be rewarded for being like Duke. 6 Responses to Parrot No More! I think I needed to hear this. I am a new mother, and my baby is still young. But, in all the simplicity in your statement of turning off the tv because it just fills time, is everything I think I needed to hear. I have tried very hard to entertain my child without the tv, she is only 8 months old, so it is not terribly hard. She does love a good dvd full of singing, dancing and colors (we don’t have cable, and we live in Japan, so really we don’t have tv unless it is in the form of a dvd). I have recently given in, due to a household of illness. Seriously everyone is sick, my daughter, my husband and myself. We are all tired and cranky, and on some form of medication, not to mention annoyed with the whole idea of mass illness. In the middle of it all, my daughter was given tv time to allow for my rest. I mean lets face it, my husband turns into a 2 year old when he is sick, and well the baby is actually a baby, so I am sorta stuck doing all of the work even though I am also sick. Now that we are doing better, it seems to have stuck. I think I just needed to hear, once again, that she is better off without. Thank you. Just reading this post, afte randomly stumbling onto your blog snapped me back. Funny how that happens. I am a teacher teaching high school students. Teaching is very challenging in today’s world. Students are demanding and parents are unforgiving, in general… Still, I love teaching. It’s part of me. I just wanted to thank you for your blog it is nice to know I am not the only one that feels this way. I just wanted to know your opinion on learning toys that are coming out for children at a really young age,to me I think that this would cause a problem with teachers due to the fact that some children would be more advanced in the classroom than others. I think teachers have enough challenges and this would cause some students to be bored with school while children whose parents could not afford or took the time to work with children would be behind,so teachers would be teaching children who are at different levels of learning. I am a great believer in imagination, I think that we take the imagination away from our kids at an early age,I am forty-two and still have mine,and it saddens me to see kids loosing theirs. i just wanted to say I enjoy reading your blog. I would be interested to know your opinion on all of the educational toys they have out for the really young children. It seems to me this would cause problems for teachers being that some parents could not afford these hurry up and learn products,and it would cause some students to be bored in the classroom and some to feel inferior. I am a firm believer in imagination,I think we are taking kids imagination away from them at an early age. I am forty-two and I still use mine,thanks to my parents who did not sit me in front of a T.V. I was going through your blog and found it really interesting that although we live at opposite ends of the world, practise different religions (I’m a Muslim by the way), have different cultures – most of our beliefs and opinions coincide. I agree that children should not be given too much tv time, that mothers should spend time reading and playing with their children rather than allow them to watch tv most of the time.Like you I’m also a teacher and while I do think that the television has its uses, I also believe that our children spend too much time glued to it. After reading your column on the advantages of work experience for teenagers I thought here’s a woman after my own heart! Not only does working give the child a sense of his own worth, it also helps him build a social conscience, teaches him to respect others and generally is good for his social development. My youngest daughter worked as a volunteer at the Petro-science Center in Malaysia and I noticed that it boosted her self confidence, made her more responsible and taught her patience especially when dealing with small children. I love your blog! Keep it up.